Helmut Richter visited the German Air Force's Penzing Air Base near Landsberg just before the UH-1Ds left and the C-160 will be retired. Fliegerhorst Penzing (Penzing Air Base), probably better known as Landsberg Air Base, is located in Bavaria close to the mid-size town of Landsberg. 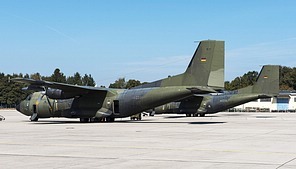 Penzing Air Base is currently home to LTG61 (Lufttransportgeschwader 61 - Air Transport Wing 61) flying C-160D Transall transport aircraft and hosted one of three SAR detachments of THR30 (Transporthubschrauberregiment 30) with UH-1D helicopters up until recently. Penzing Air Base was constructed as part of the German Wehrmacht build-up in the 1930s and started operation in early 1937. Until the end of the second world war it hosted a range of first line units. After the war, the USAF continued to use the base as Landsberg Air Base. In 1953, the 7351st Air Base Group was established to control the air base, which in the context of the creation of a training centre became the 7351st Flying Training Group in early 1955 and, in October 1955, the 7351st Flying Training Wing, equipped with Harvard Mk.4 aircraft, was established for the training of NATO pilots. In the course of the build-up of the new Luftwaffe starting in 1955, agreement was found with the USAF to take over Landsberg Air Base and establish a flying training school using the assets of the 7351st Flying Training Wing. Training of the first “conventional refresher” courses for previous WW2 Luftwaffe pilots began in 1956 and the first new students were trained in 1957. In the meantime, the FFS “A” (Flugzeugführerschule “A” - Pilot Training School “A”) had been established at Landsberg for basic jet training. In addition to the Harvard Mk.4s, Fouga CM170R Magisters began reaching FFS “A” in 1958. Fouga Magister AA-152 is preserved on base in memory of this period. Because there is no example of a Harvard Mk.4 displayed at Penzing, I have included an image of the nicely preserved AA-615 at the Luftwaffenmuseum Gatow. During the same period, FFS “B” was established at Fürstenfeldbruck with T-33As for advanced jet training and FFS “S” at Memmingen for pilot candidate screening as well as for transport aircraft and helicopter pilot training. FFS “A” was disbanded in 1966, after the jet pilot training for the Luftwaffe had been transferred to the USA to benefit from the much better weather conditions. FFS “B” became WS50 (Waffenschule 50 – Weapon School 50) for advanced training of Fiat G.91 pilots and FFS “S”, now at Wunstorf near Hanover, only retained multi-engine instrument flying training using the Nord 2501 Noratlas. The new occupant of Penzing Air Base became HTG64 (Hubschraubertransportgeschwader 64 – Helicopter Transport Wing 64), which had been created as a unified wing in 1966 from various helicopter squadrons. In 1971, HTG64 with its UH-1Ds left for Ahlhorn in Lower Saxony with the exception of the 1st squadron (1./HTG64) to make room for LTG61 with its brand-new C-160D Transall aircraft. LTG61 had been established at Neubiberg near Munich in 1957 with Nord 2501 Noratlas and C-47D Dakota aircraft and had only recently received its first Transalls. Although the N2501 never operated from Penzing, N2501 N°128 is proudly presented on base with LTG61 markings as GA-125. N2501 N°128 is actually a French example which was donated in 1987 by ET62 on the occasion of LTG61’s 30th anniversary. 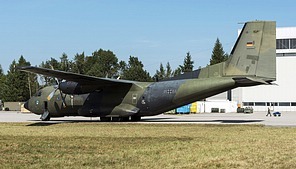 In the course of the transition to the C-160D, LTG62 at Ahlhorn was disbanded and made place for HTG64, but LTG63 at Hohn near Rendsburg and FFS “S” both transitioned to the Transall. FFS “S” continued in the transport as well as in the flying training role. In 1978, FFS “S” was renamed LTG62 retaining the FFS “S” badge which appropriately shows a blindfolded crow. Of the 110 C-160Ds ordered, 20 went to Turkey in the early 1970s, leaving 90 for use by the Luftwaffe. 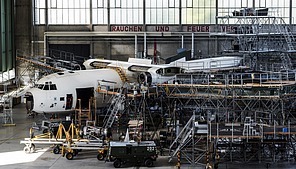 Considering a few aircraft operated by the Erprobungsstelle 61 (ESt61 – Test Establishment 61) , later WTD 61 (Wehrtechnische Dienststelle 61), and aircraft in major overhaul at the manufacturer, there were around 25 Transalls allocated to each LTG. At Penzing, the next change occurred in 1979, when 1./HTG64 became part of LTG61 as 2. and 3./LTG61. 3./LTG61 later moved to Nörvenich. When the swap of helicopter capabilities between Heeresflieger (army aviation) and Luftwaffe was ordered in 2012, the UH-1Ds still present at Penzing for SAR duties became part of THR30 but remained at Penzing. UH-1D 71+10 is preserved at Penzing with LTG61 badge in memory of more than three decades of UH-1D operation with LTG61. Major changes for the three transport bases of the Luftwaffe were forthcoming with the preparations of the Luftwaffe for the 40 new A400Ms. It was decided to concentrate A400M operations at a single air base and the only base which has enough area to accommodate the infrastructure upgrades to allow operation of 40 of the significantly larger aircraft was Wunstorf, even though Wunstorf also has some operational restrictions due to the proximity to the Hanover airport. 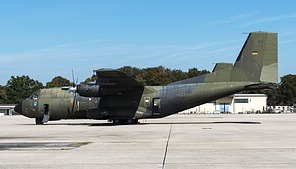 As a consequence, C-160D operations at Wunstorf were already terminated in 2015. LTG61 at Penzing will be disbanded in 2017 and the base will be given up in due course. LTG63 at Hohn will continue to operate the C-160D mainly in the tactical role. Run-down at Hohn is expected to start in 2019 and, according to current plans, LTG63 will be dissolved and Hohn closed in 2021, which will bring the final end to C-160D operation by the Luftwaffe after nearly exactly 50 years of service. LTG62 at Wunstorf will thereafter be the only transport wing in the Luftwaffe, still with the blindfolded crow of FFS ”S” in its badge! The visit in September 2016 was organised by the “Freundeskreis Luftwaffe” and was very informative. During the visit, there were already many indications of the coming end to LTG61 and the air base. The run-down in staff, in number of aircraft and flying hours had already been ongoing for a while. Staff had come down to a little more than 900 and the number of aircraft still operated by LTG61 was only around 10. There was just a single mission flow that day. 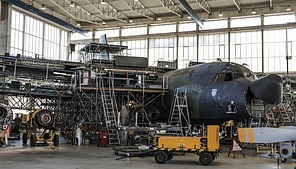 Another indication and a sad sight indeed is the ongoing “Hochwertteilegewinnung”, the recovery of high value parts from retired airframes before scrapping. At the time of the visit the white 51+15 was in the final stages of this process in one of the hangars. Because the airframe had already been taken off charge, the tactical code was painted over. In the second hangar position a major inspection was performed on 50+17, which was carrying the LTG63 badge. Still present on base was the SAR detachment of THR30 (formerly 2./LTG61) for SAR duties in the Bavarian mountains. There were two UH-1Ds on duty with SAR markings, of which one (71+69) was a specific lightweight version with some equipment removed for higher altitude SAR duties. The UH-1D will continue to be operated in the SAR role by the three SAR detachments of THR30, the two other ones being at Nörvenich and at Holzdorf, until a replacement is in place which will not be before 2019. Two further UH-1Ds in standard Heeresflieger tactical colour scheme were present in a hangar. The SAR detachment at Penzing has in the meantime (December 2016) moved to Niederstetten, the home base of THR30. This location is not ideal because of its much longer distance to the alpine area of operation. Before the C-160 fly-out in 2017, there will be the celebration of “80 years Penzing Air Base” and “60 years LTG61” anniversaries at Penzing during the “Tag der Bundeswehr” on 10 June 2017. There seem to be plans to present a Transall with anniversary color scheme for that event and for the fly-out later in 2017. I like to thank Freundeskreis Luftwaffe and the staff of LTG61 and of the THR 30 SAR detachment at Penzing for a very instructive visit and for the excellent photo opportunities on base.